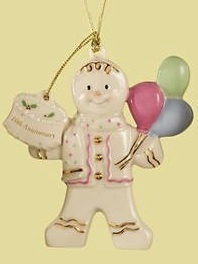 Lenox presents the Gingerbread Gala 10th Anniversary Ornament, a special-edition commemorative ornament. A smiling gingerbread man carries a bunch of brightly colored holiday balloons. He wears a festive jacket trimmed with pink icing, a scarf dotted with pink and green sprinkles, and an adorable sparkle in his eyes. To mark this special anniversary, a delicious-looking cake charm is suspended from tassel cord. Details Here!